Postcard DE-3274224 from Germany shows a city view of Bremen in northwestern Germany. A commercial and industrial city with a major port on the River Weser, Bremen is the second most populous city in Northern Germany and the tenth largest city in Germany. 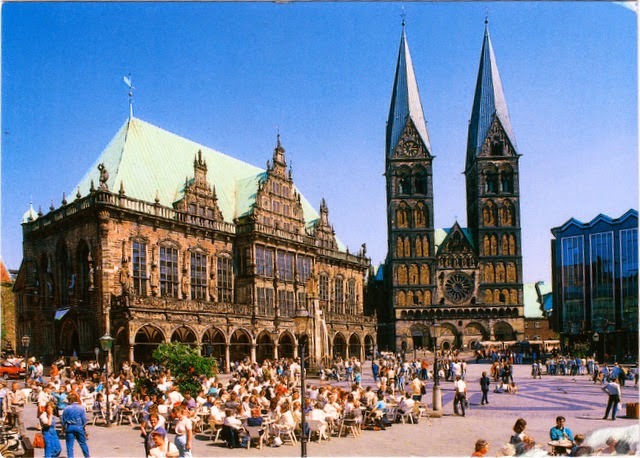 The market square in the city center is shown on the card, with Bremen Cathedral, dedicated to St. Peter, in the background. The cathedral belongs to the Bremian Evangelical Church, being protected by the monument protection act since 1973. The cathedral has twin 99-meter towers, built between 1215 and 1253, guarding the main entrance on the west side of the church. The towers were reinforced and given pyramid-shaped tops in 1346. Rhenish styled "helmets" were added when the towers were restored and raised in the 1890s, as still seen today. It is interesting to see that the crossing tower, a reminder of the original west front towers, also have a pyramid-shaped cap. Bremen is home to the football team SV Werder Bremen that have won the German Football Championship and the German Football Cup multiple times. The team's home stadium, Weserstadion, almost completely surrounded by solar cells, is one of the largest buildings in Europe powered by alternative energies. Coincidentally today, Germany have advanced to the FIFA World Cup Final today with a sensational 7:1 victory over the host Brazil at the Estadio Mineirao in Belo Horizonte.